I have been lucky to practice my craft as hairdresser for the past 35 years. I have seen many styles come, go and then come back into style again. What other career could be so rewarding? The relationships I have made over these years can compare to no other. We are there for our client’s weddings, birth of their children, anniversaries and when they lose a loved one. Getting to practice what I love to do and making people feel great about the way they look, not many professions can compare to that. 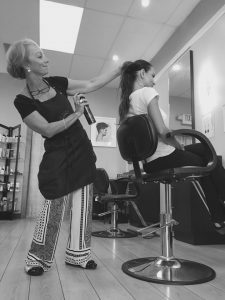 Hairstylists have an amazing opportunity to make their client’s look and feel their best! I went into this industry because I didn’t want to go to college. I just liked to play with hair. I did not realize at the time, any of the possibilities. “Just playing with hair” opened more doors for me than I could have imagined. I lived through the tough period when AIDS devastated our industry and we lost many beautiful friends. I will never forget those times. They were a very influential time in my life. This life as a stylist has been amazing and I feel blessed to have experienced it. Our industry celebrates working women and moms. 1) Do not be afraid to work hard. Now a days everyone wants to be successful working 20 hours a week. The world just does not work that way. Stay late and come in early for the clients and coworkers who need your help. I often still work 6o plus hours a week. It truly pays off and has been a remarkable experience. 2) Know that there will be sacrifices. I missed a bunch of my kids baseball, football and gymnastic meets. Those were tough choices. I had few options at the time, as a single mom with my children depending on me. The ones that love you, will understand and be supportive of your sacrifices. There is so much of that in the beauty industry. It’s a sign of a lack of confidence and stops us from learning. Surround yourself with stylists and friends who are better than yourself. Then watch and study everything they do. Never be afraid to ask them questions and say the simple words of “Thank You”. 4) Don’t settle or get too comfortable, for you will stop growing. It is easy to rise to the top, but it is tough to stay there. Be humble and learn from everyone around you. Take as many education classes as you can. When you find yourself getting too comfortable, it’s time to invest in yourself. Learn some new techniques and do things different. I had and still do have a hard time with this one. I’ve wasted a lot of time worrying about all the things that could go wrong, but most of the time did not. I have found great things happen once you set your dreams into motion. Carleen Buden is the founder of Chameleon Hair Colorcafé and Spa.